Hyundai Refrigerated Vans are a great way of preserving frozen meat and produce in optimal frigid condition during transport. 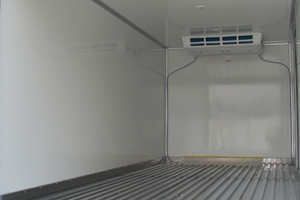 They feature a powerful refrigeration unit that supplies cold air to the body of the truck for low temperature maintenance. The 70 or 80 mm thick polystyrene – insulated panels used for the body offer superb thermal insulation by effectively blocking the penetration of external heat. Hyundai Cool Vans are designed to transport cold-storage goods such as flowers or vegetables in a body configured after that of a dry vain instead of a refrigerated van. This configuration makes the Cool Vans more competitive in price than the Refrigerator Vans, making them an ideal choice for any transport jobs requiring storage of goods at degrees between 0 ~ -5 °C. Hyundai Insulated Vans are a cousin of the refrigerated vans, except that they are without a refrigerator. Dry ice or ice bags are used instead, if necessary, to keep the interior of the body cool. 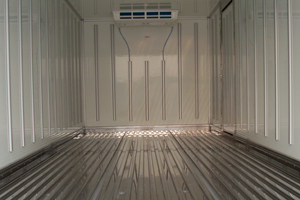 The configuration makes the Vans an ideal, cost – effective choice for short distance transport jobs of cold storage food products. Hyundai Dry Vans carry goods in a box-shaped body. 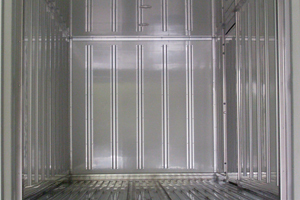 This configuration gives the Vans all-weather operability and prevents the risk of cargo falling off the truck during transport as in the case of open – bed cargo trucks. The Vans’ industry – leading robustness in construction prevents the shaking of the body in motion, while offering excellent protection against external impacts. Hyundai Eutectic Cold Vans are ideal for delivering ice cream. They use electricity from an external outlet to cool the refrigerants inside the eutectic plates overnight, which in turn keeps the interior of the cargo box cool during a day. The Eutectic Cold Vans are an economical alternative to refrigerated vans requiring an auxiliary engine for freezing purpose. They savings in freezing maintenance costs, however, do not compromise their freezing capacity, for they are capable of freezing up to -35 ℃. Hyundai Bottle Carriers are a specialized vehicle for transporting beverage products. The body of bottle carrier is sectioned into several compartments suitable for safe storing of beverage products. The fold – down side steps provide easy access to each compartment, facilitation the loading and unloading of bottled beverages. The external side panels make excellent space for advertisements. Hyundai Wing Body Trucks feature dual wing gates attached to the center high beam of the body. The wing gates are operated by a hydraulic power system and a remote controlled switch. The Trucks are used to load cargo packaged boxes on pallet with a forklift which doubles loading and unloading speed. The wing Body Trucks are an innovative solution to today’s logistic needs, guaranteed to add considerable value to your business by offering unmatched speed and ease of operation.